From there you enjoy a marvellous view. 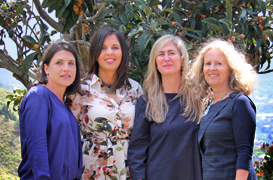 Spending most of the time outside you enjoy a pleasant climate almost all year-round. 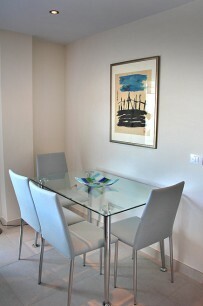 The Holiday Apartment is located in the newly built Apartment House Secadero, on the outskirts of Villa de Tazacorte. 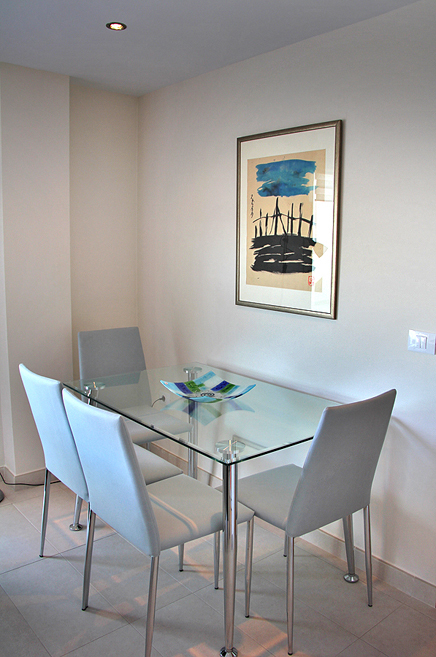 Balcón de Luz comprises 3 bedrooms and 2 bathrooms as well as a living-dining area with a fitted kitchenette. 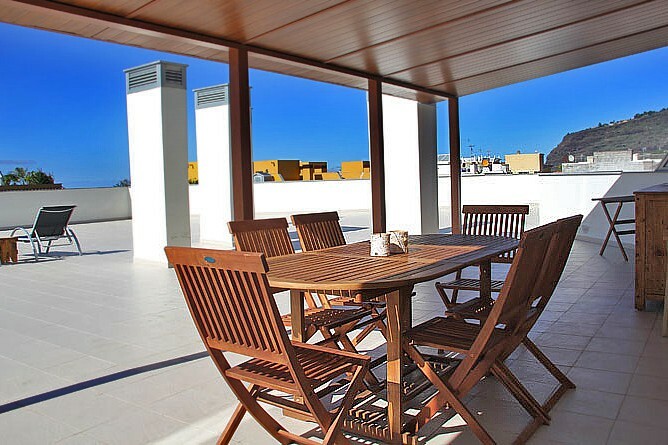 The very spacious roof terrace (300m²) is for your exclusive use. 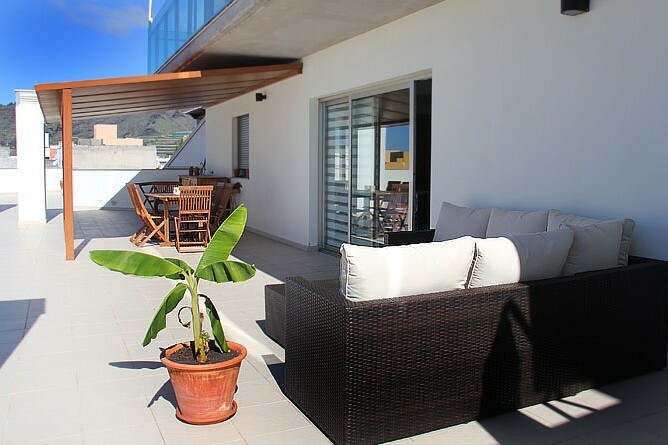 The well cared of Holiday Apartment Balcón de Luz was completed at the end of 2014 with its first-time occupancy in 2015. A lift is available. 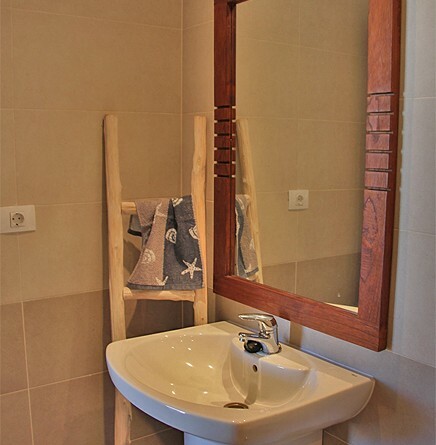 The whole high-quality furnishing is new and modern. 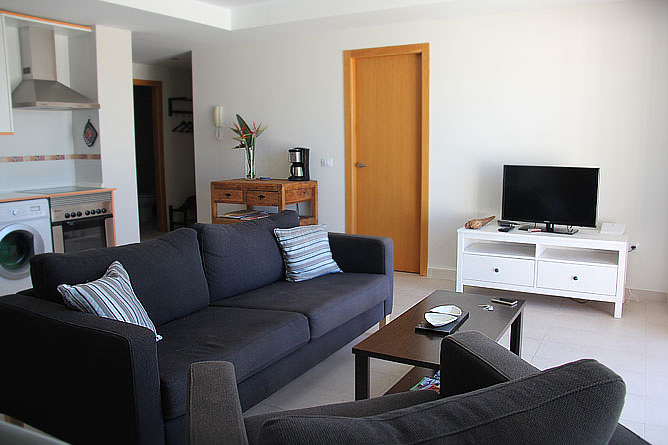 The light-flooded Holiday Apartment comprises a combined living-dining room and a fitted kitchenette, 2 bedrooms with a double bed and another room with a sofa bed as well as 2 bathrooms. 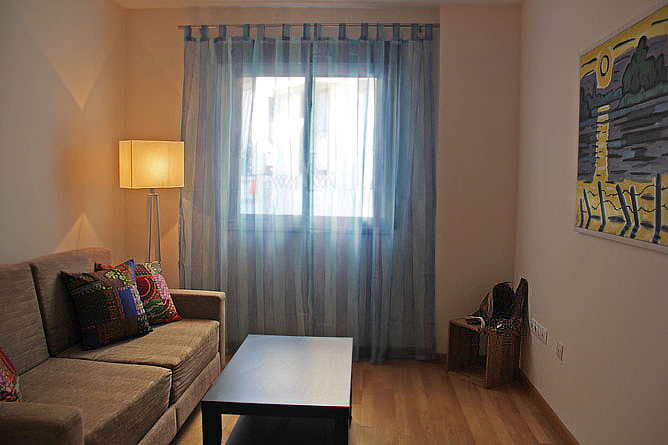 The living room is light and friendly, glass sliding doors open to the terrace. 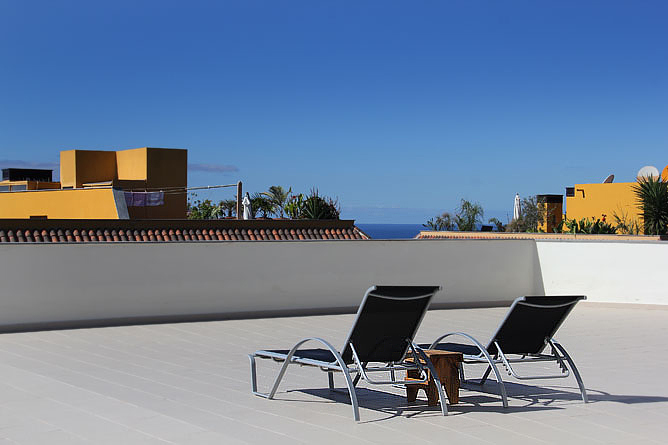 The 300m² private roof terrace is exclusively for the guests of the Penthouse Holiday Apartment. 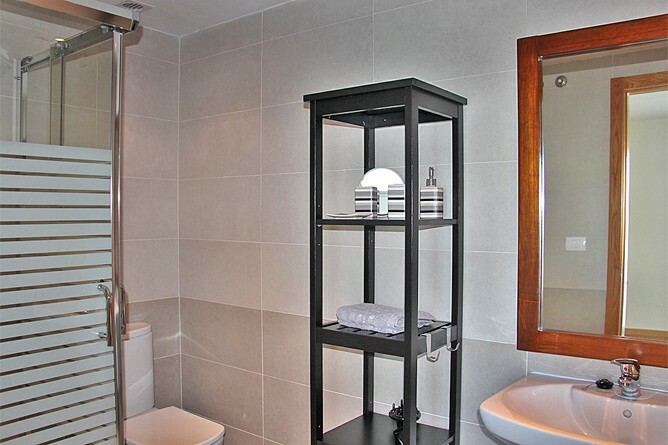 The well equipped kitchen leaves nothing to be desired, a dish washer is also available. 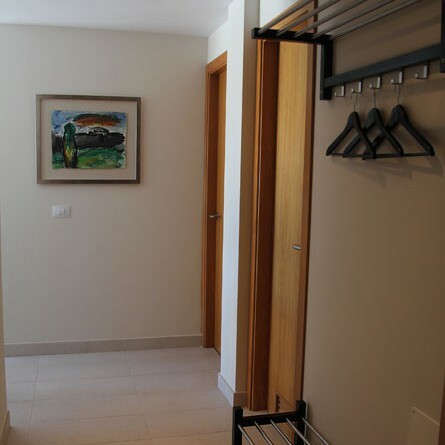 The 2 bedrooms are facing the terrace. 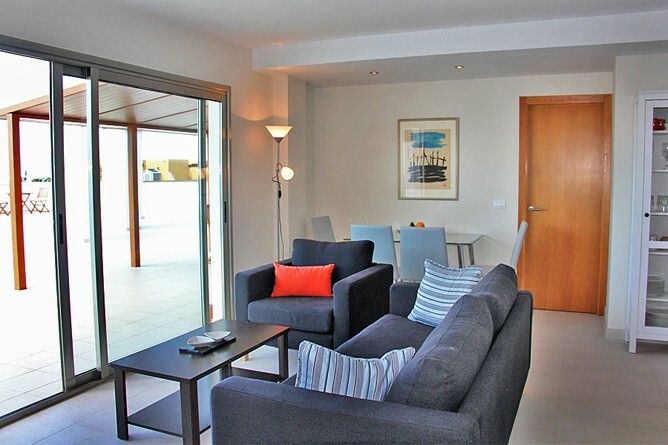 Glass sliding doors in the main bedroom provide access to the terrace. 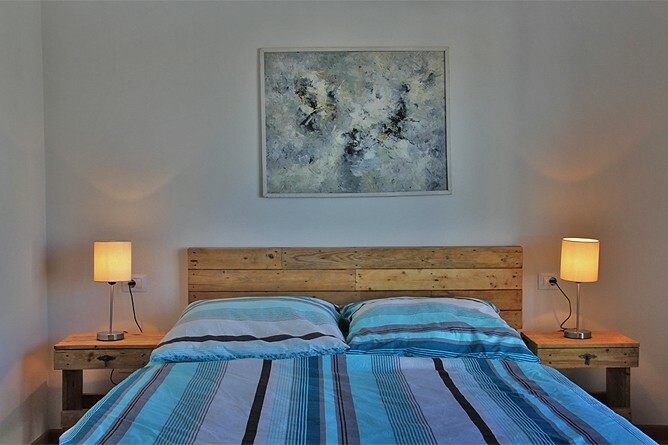 The second bedroom has a window and there is another bedroom with a sofa bed, which is perfect for one or two children. 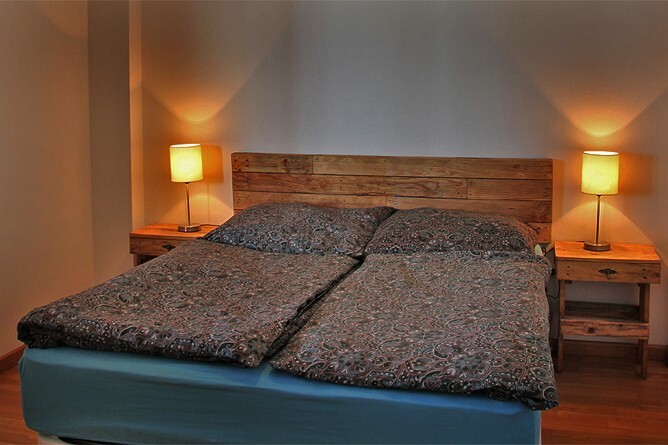 The beds and bedside tables in the main bedrooms are made by a local carpenter. 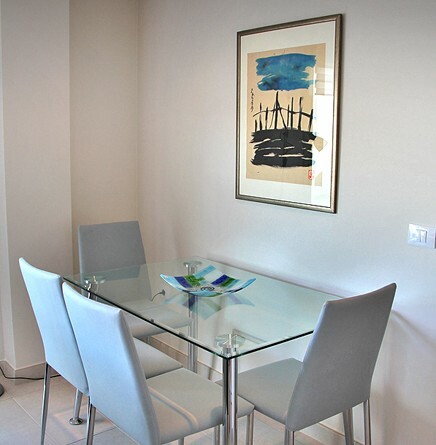 Modern paintings (originals) and tasteful decorations complement the furnishing. 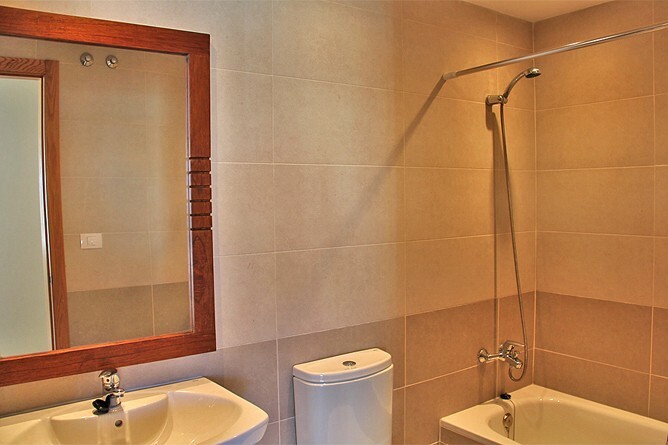 One of the two bathrooms has a bath tub and a toilet, the other one has a shower and a toilet. A washing machine is also available. 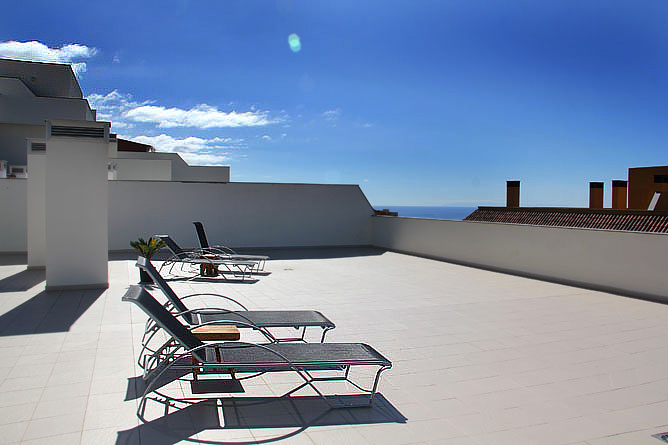 The 300m² terrace features a 22m² roofed area, allowing you to enjoy a sunbath as well as a shady sitting area. 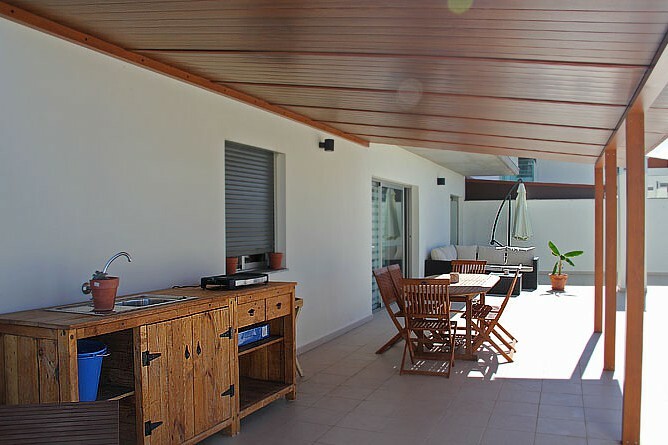 The large wooden table is ideal to enjoy open air dining regardless of weather conditions. 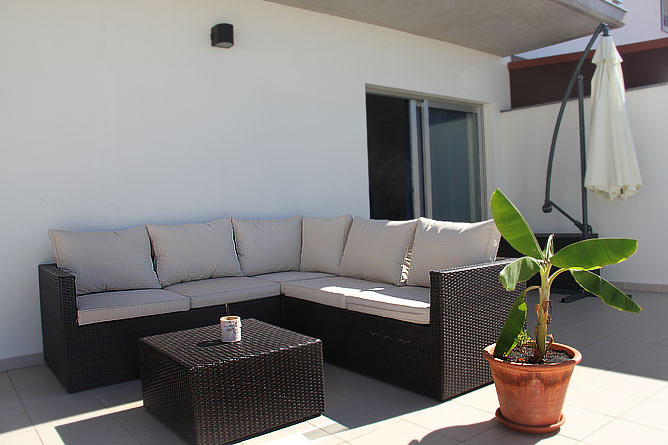 A movable small table and 4 sun loungers are also at your disposal. 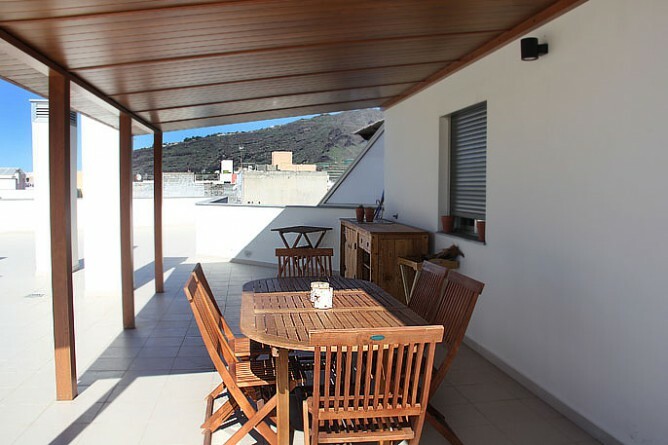 The owners plan to add an outdoor kitchen as well as a barbecue area to the roof terrace. 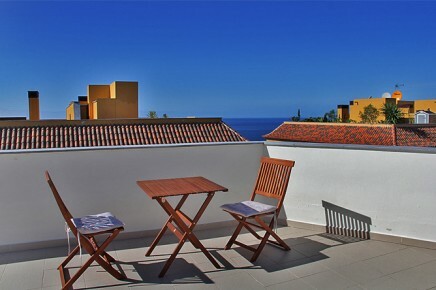 The terrace provides sun almost all day long as well as a limited sea view. 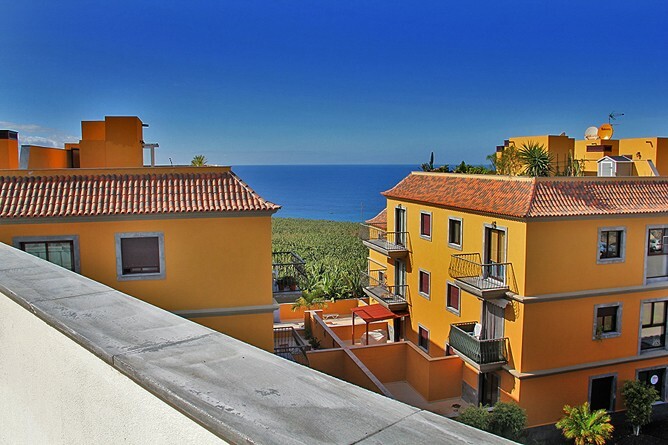 You also enjoy a side view of Villa de Tazacorte and the slopes of the Canyon Angustia. 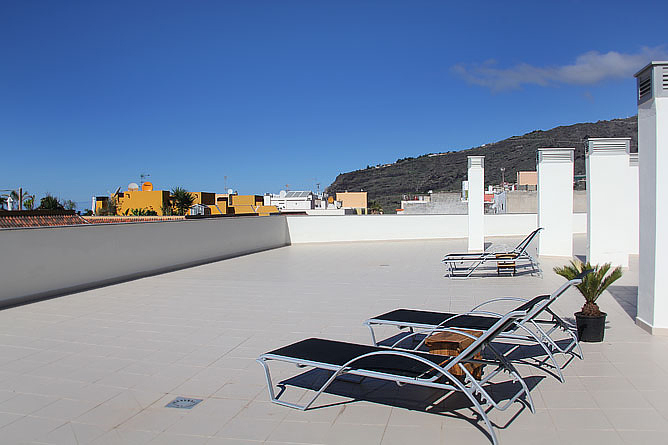 The sandy beach of Puerto de Tazacorte is located within 5 driving minutes. You can also enjoy a 25-minutes hike town through banana plantations. In Puerto Tazacorte, right at the harbour boat trips are offered for whale and dolphin watching or to enjoy an exquisite dinner menu on an old fisher boat while watching the sunset. 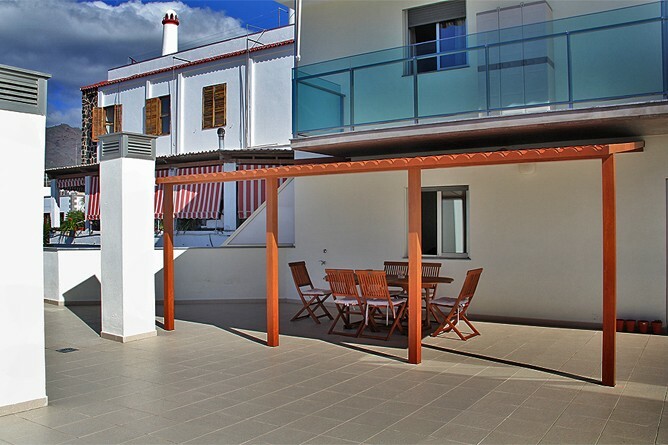 Villa de Tazacorte is a very charming village with colourful lanes and a beautiful promenade as well as a Plaza in the centre. 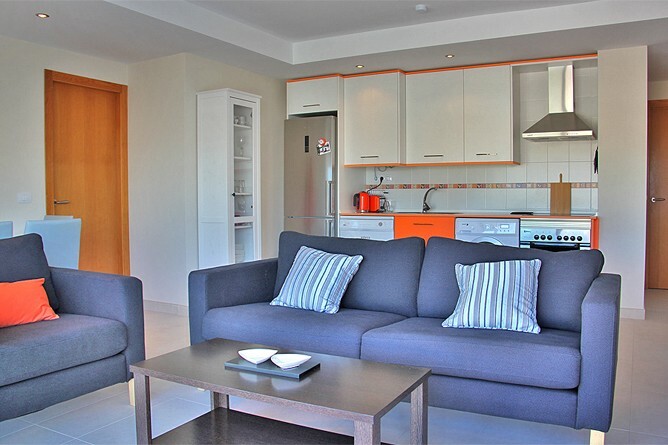 Many shops, bars and restaurants are located within a short walking distance from the Holiday Apartment. We highly recommend the restaurant Carpe Diem in the historic center. Opposite the apartment house there is the public swimming pool, opened only during the summer months. The connection of the village to the public transport system is very good, so that you do not necessarily depend on a car. We recommend a rental car anyway, so you will be able to discover the versatile natural beauty of the island. Due to its central location in the west of the island all hiking areas and trip destinations are within easy reach. Modern Holiday Apartment with 300m² Terrace.